The marijuana black market that has been huge for decades still far larger the legal market. Though 10 states and Washington D.C. have legalized recreational cannabis, black market weed still dominates. Even in states like California, the illegal cannabis market is several times bigger than the legal adult use market. In other words, black market weed does not disappear the moment a state or country legalizes recreational cannabis. Instead, legalization highlights just how entrenched the black market is—even in the post-legalization era. Here’s what every entrepreneur should know about legal weed’s more established alternative. 1. The US black market accounted for $46.4 billion in illegal weed sales in 2016. In a $52.5 billion dollar cannabis market, $46.4 billion went to illegal weed. In other words, the recreational cannabis market is only putting a small dent in black market weed sales. 2. Black market weed dominates even in states that have legalized. In some states with recreational cannabis (California and Washington), governments still struggle to contain the black market. Washington State levies a 37 percent excise tax and 44 percent retail tax on recreational cannabis, which is actually more lenient than the original tax plan, under which the state taxed each step of the supply chain 25 percent. However, a study found that Washington’s 44 percent retail tax has negatively affected sales, most likely because consumers have returned to cheaper black market alternatives. 3. Black market weed costs less than half in California. In California, illegal marijuana costs approximately $20 for an eighth of an ounce, whereas the legal version is around $50. 4. Taxes, licenses and lab testing boost illegal sales. Why would producers and consumers sell and buy weed illegally in states that have legalized it? High retail taxes and low accessibility turn consumer attention back to the black market. For producers, expensive or inaccessible licensing, strict lab testing requirements and high taxes encourage them to sell their product on the already established black market. 5. DEA cannabis seizures fell 35 percent in 2017. 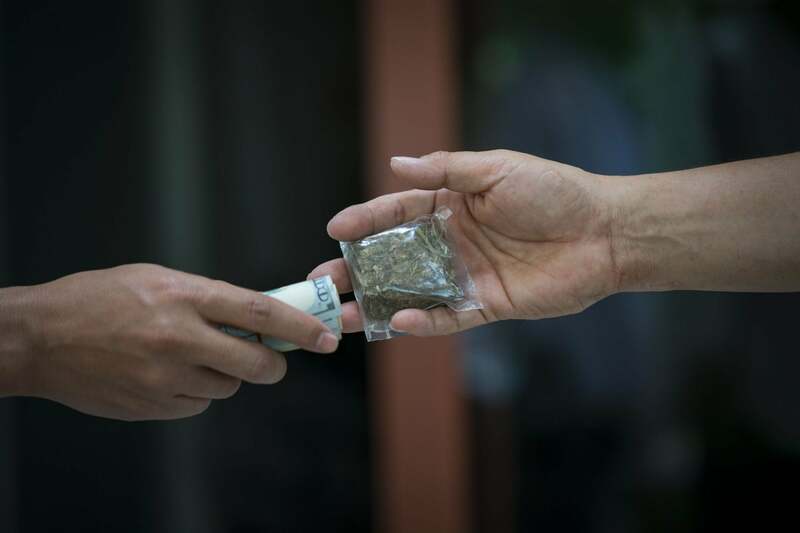 Though the black market is bigger than its legal alternative, statistics show that DEA cannabis seizures fell from $12.8 million to $8.3 million between 2016 and 2017. This may indicate black market sales have decreased, too, though another factor could be decreased government focus on the mairjuana black market. 6. New York has the biggest black market because New Yorkers consume the most weed. Despite the West Coast’s reputation, New Yorkers consume the most weed per capita in the world. New York City consumed 77.44 tons of cannabis in 2017, according to data from Seedo, a cannabis grow supply company. If New York legalized recreational weed, the market would be worth an estimated $3.1 billion. But for now, the black market is reaping the profits of the biggest cannabis market in the country. 7. Legalizing cannabis has reduced violent crime on the U.S.-Mexico border. Research has found that legalizing medical cannabis in states bordering Mexico led to a 12 percent decrease in violent crime along the border. Since this research considers data from 1999 to 2012, it’s likely that recreational cannabis in Oregon, California and Washington has had an even larger impact on violent crime along the US-Mexico border in recent times. 8. Outlaw growers far out-produce the legal market in California. Though it’s hard to quantify the exact amount of cannabis sold illegally, some estimates say that it outweighs legal weed 5 to 1 in California. This can mean a lot of different things. Some cannabis producers grow weed to illegally sell in other states; Others run dispensaries without licenses or paying taxes, or resell products that don’t meet state safety standards on the black market. 9. Legal weed can be cheaper than black market weed in Oregon. California’s high weed prices are by no means universal. Oregon took a different approach to cannabis than neighboring states California and Washingon State. Instead, Oregon allowed growers to apply for multiple licenses and had low licensing fees. This saturated the market and contributed to a 50 percent price drop. 10. Limiting at home cultivation curbs black market weed production. Until 2017, Colorado residents were legally allowed to grow up to 99 cannabis plants at home due to a legal loophole. According to new legislation that restricts at-home cannabis growth, black market producers were using this loophole to grow massive amounts of weed illegally in private homes, which contributed to a general rise in crime including weapons trafficking, human trafficking and illegal out-of-state sales. Today, Colorado only permits a maximum of 16 plants per household. 11. The DEA says that legal marijuana fuels the black market. The profit margins for black market weed are much better than for legal weed. According to the DEA, Colorado cannabis legalization has attracted organized crime cells that produce cannabis in-state, then sell it out of state. In this way, legalization could have grown, rather than starved, the black market in Colorado. However, with national legalization, illegal out-of-state cannabis trade would greatly diminish. It could eventually resemble something like the illegal cigarette trade in terms of volume. The black market still accounts for the lion’s share of cannabis sales in the U.S., and even more so worldwide. But as more and more states legalize cannabis, the black market is changing, too. For one, the black market’s importance is shaped by state-by-state laws. The higher the taxes on the consumer and business, the more likely both are to turn back to the black market. And the bigger the disparity between profits in legal weed markets, the more incentive farmers have to illegally sell their cannabis across state borders.